Please join us on November 18th at 6:00pm at the White Birch Vineyards Tasting Room in Skaneateles NY for the 2015 New Wine Release Pairing Dinner with Chef Luke Houghton of Pure Catering & Events. 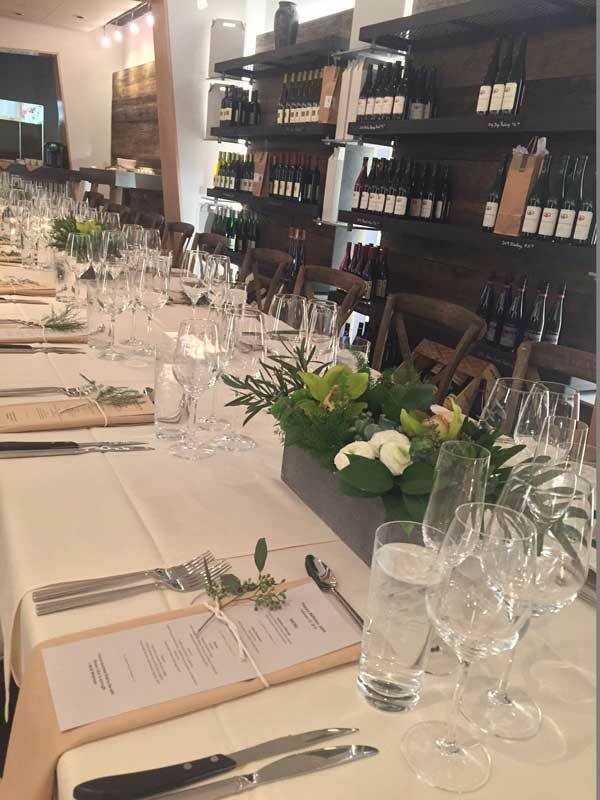 Each delicious course is perfectly paired with White Birch Vineyards and Ravine's 2015 wine. Tickets are $85 each (tax is included, gratuity is not) and our pairing dinners tend to sell out quickly so please purchase your ticket online or call the Tasting Room at 315-685-WINE(9463) today to make your reservation. White Birch Vineyards Chardonnay must love the soil in Skaneateles because year after year it strives. Aged in french oak barrels giving great mouth feel and a beautiful blonde color. Notice subtle hints of vanilla, ripe golden apple and white flowers. Enjoy this wine with lobster, grilled chicken or hearty cheeses. White Birch Vineyards Silver Fox Red Blend is a tribute to the patriarch of the Falcone Family and the founder of White Birch Vineyards & Hobbit Hollow Farm; Mr. Michael J. Falcone. A medium body blend of Blaufrankisch & Merlot. This wine has a vibrant garnet color with aromas of pomegranate & plum. On the palate experience great tannins hints of deep black cherry, spicy pepper and allspice. Perfect wine to cellar or enjoy among great company. Pair this wine with lamb, steak or blue cheese. 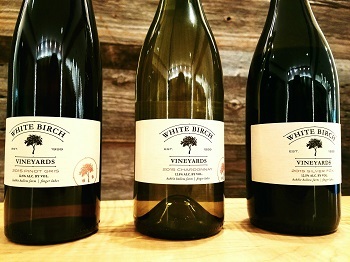 For a limited time only enjoy our 2013 White Birch Vineyards Dry Riesling at 10% OFF A BOTTLE & 15% OFF A CASE! This wine is always a fan favorite during the holidays. With flavors of lychee, minerality & pear. A perfect wine to enjoy with your holiday dinner of glazed ham, turkey & pumpkin pie. Harvest time at White Birch Vineyards is the culmination of the growing season where the long hours and months spent tending the grape vines comes down to a compact few weeks of physical labor and stressing about the weather. 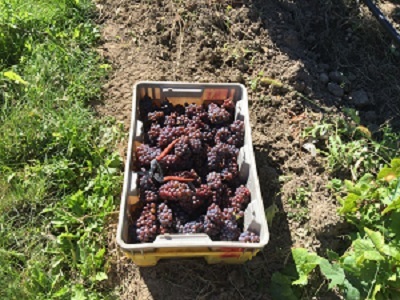 The Pinot Gris is a tough varietal to pick; the clusters are small like little pine cones and the wasps are in a frenzy of activity around the clusters and picking lugs. However, the sugar in the grapes is enough to keep the wasps occupied so they tend to stay away from the individuals picking, unless you happen to grab a cluster that a wasp is feeding on. 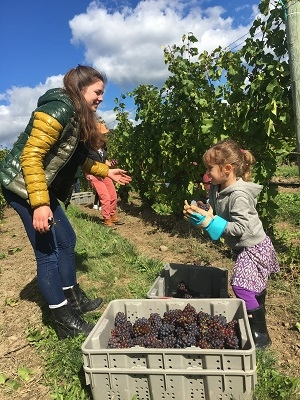 The White Birch Vineyards Pinot Gris pick was a fun experience having three generations of the Falcone family, owners of the vineyard, participating in the harvest of the fruit. By the time this blog makes it to the web the Sauvignon Blanc will also be picked and pressed. Next to be picked is the Pinot Noir. After we check the sugar and acid levels we forward the info to our winemaker, the great Morten Hallgren of Ravines Cellars. Morten makes the 50 minute drive from Geneva to our site annually to visually inspect and taste the fruit. This season has been hot and very dry with warm nights dropping the acid levels and raising the sugar levels quite rapidly. Currently the Pinot Gris and Sauvignon Blanc are ripe for the picking. Harvest season is always a fun but challenging time trying to get the fruit off the vines before the rains come. 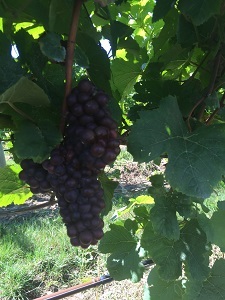 When the grapes are ready to pick there are many other fruit and vegetable crops also ready to harvest making it tough to get as many pickers to help as we would like. Lucky for us we have an experienced group of pickers that is quite a marvel to watch work. We are lined up to pick the Pinot Gris in the next few days. Left photo is Sauvingnon Blanc and right photo is Pinot Gris. As the grapes ripen they lose acid and gain sugar. Throughout ripening we randomly collect 100 berries of each varietal to be test sugar and acid levels. 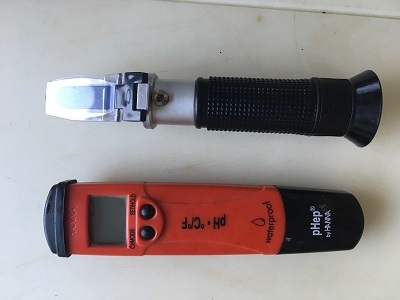 We press the juice out of the berries and use a refractometer to check the sugar level and a ph probe to check the acids. It is possible to get the fruit to extremely high sugar levels in warmer climate growing regions, however, in cold to cool climates the level of sugar and acids fluctuate with the growing season. The fluctuation from year to year results in a different wine from vintage to vintage. 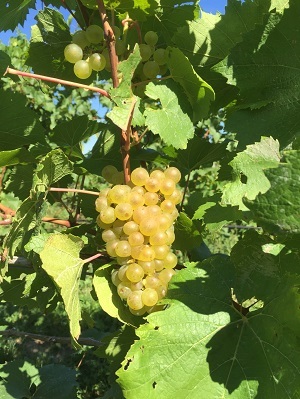 The fruit that is ready to pick first in our vineyard is Sauvignon Blanc and picking should begin in a week to ten days depending on the weather.